The Allies took Hamburg on May 3, 1945. 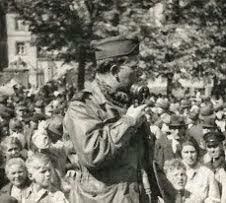 Bill Downs broadcast to the United States using the microphone belonging to the propagandist Lord Haw-Haw, who had by then fled north headed for Flensburg. This is Bill Downs reporting from Hamburg. I believe this is the first live broadcast from Hamburg to the United States, which has little significance except to prove that the Germans here have really surrendered totally, including their radio station. Another insignificant fact about this broadcast is that I happen to be using the same microphone used for years by the British traitor, Lord Haw Haw. This notorious Nazi broadcaster used this microphone, they tell me, only three days ago. Then he left in a hurry. He hasn't been picked up yet, but he will be. The Hamburg radio setup isn't bad, even by American standards. The Allied military government information control unit is now operating the station broadcasting news and music programs daily. The difference is that the news now being broadcast is the truth, and the news is broadcast in a half-dozen languages for the benefit of the 45,000 slave laborers who are awaiting transport home from their forced labor in the Hamburg area. The engineers transmitting this program are German, but a British soldier with a very big rifle is standing by even though he doesn't need it. The people of Hamburg have had enough of war. When you look at their city, you can see why. This is a city with a peacetime population of a million and a half, the second largest in Germany, second only to Berlin. It is, I believe, about the size of Cleveland, Ohio. At least it was until the American and British air forces started their strategic bombing program to cripple Germany's largest port. Right now I could take you in my jeep for a ride of any 25 miles through the streets of Hamburg and pay you a dollar for every undamaged house you could point out. I don't believe I would lose a five dollar bill in doing so. There is acre after acre of nothing but bricks and rubble. Particularly in the port and manufacturing area do you see nothing but twisted steel and shattered walls and broken bricks. The estimate is that over 80 per cent of the city of Hamburg has been destroyed, but it is almost 100 per cent damaged. No wonder the people of Hamburg have had enough. 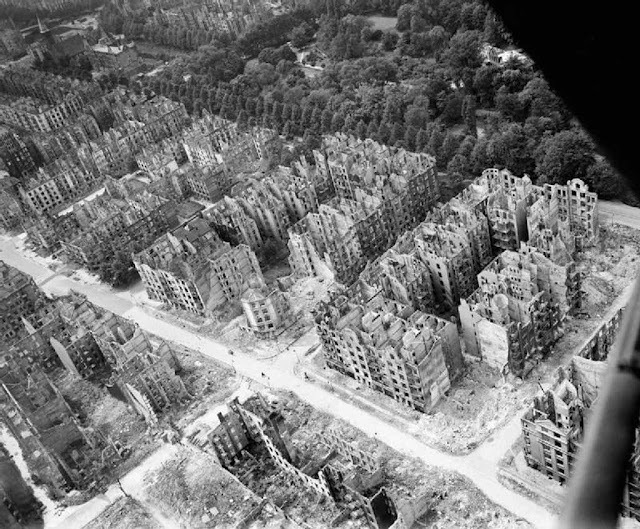 The initial impression that I got of this city is that the people of Hamburg, who had sense enough to surrender before the whole area was completely reduced to ruin, are much more friendly than any other German city in which I have been. People smile at you, and sometimes they wave. And there is an international flavor about the city, a hang-over from the days when it served as Germany's Number 1 port. Perhaps it was for this reason that Hamburg got the reputation of never quite being a totally Nazi city, although there were and still are plenty of Nazis around. I had a talk with the British military governor today and he said that he was receiving every cooperation in strict accordance with the terms of the city's surrender the day before yesterday. By surrendering early, the people of Hamburg have a 48 hour head start on the rest of Northern Germany, Denmark and Holland. And this is the first Nazi city that I have come upon where it is reported that the thousands of slave laborers received anything approaching good treatment. The military governor said that these people, mostly Russians and Poles, were kept in some 300 camps in the city area. Our sorry investigation indicates that they were adequately housed and fed, which is something new to find in Germany. As a result there has been little of the violent reaction from the slave laborers that has characterized the capture of other cities. Perhaps this modicum of good treatment was doled out because these people were needed in the port, because Hamburg is one of Germany's greatest ship-building centers and the home of the great Blohm and Voss marine construction concern. I took a long drive through the dock area today. Much of it is wrecked, but it is so large that not all of it is damaged. At one spot there are 14 partly constructed submarines on the ways. We have captured a number of ocean going cargo ships, ranging up to what appeared to be 10,000 ton vessels. And already the seamen who command the hundreds of little tugs who do harbor work and the small coasters who sail the Baltic and the waters between Sweden and Norway—already a large fleet of these little ships are getting up steam in the hopes that they will be able to resume work. The great port of Hamburg is already coming to life. Hamburg, despite its devastated condition, is the most normal big German city that I have seen. There is running water in the city, and electric lights, and the big suburban electric tramway is operating to the outlying districts of the city. And already the city's population is swelling. People who evacuated their homes to get away from the bombings are beginning to come back. However, many have a strange conception of the meaning of unconditional surrender. Often they find their homes have been occupied by the slave workers who have been forced to withstand the bombing. They come to the military government and ask for authority to evict these people. But they get unsympathetic answers. The forced laborers stay put until they can be sent back to their homes, and the Germans look for billets. But the most fantastic sight in Hamburg today is the surrender of thousands of German soldiers under the terms of the capitulation that went into effect at 8 o'clock this morning, 15 hours ago. German officers, German marines, women naval ratings and land girls, the Luftwaffe, the navy; every branch of the German military organization is pouring in by the thousands. They turn in their arms, their kit is searched, and then they are put into huge laagers. Even some members of the German Volkssturm, who usually are armed only with a shotgun and wear an armband, even these types are showing up to surrender. With so many real soldiers on hand, these civilians, most of who have never fired a shot, are disarmed and sent home. And I did not see a single soldier who seemed unhappy that the war was over. Only a few young officers maintained a pose of having their Hitlerian dignity injured. Everyone else was damn glad to get rid of his gun. Driving to the studio today, I passed a big football field. I had to look twice before I realized that the stands were jammed with people…thousands of them. I looked out on the playing field, and there wasn't a soul. And then I realized that this crowd were war prisoners. I went into the field, and there was a quiet, docile atmosphere about the place. The sort of atmosphere you get in an American football crowd between halves. Germans of every description sat quietly, chatting to their neighbors and doing nothing in particular. Bored British sentries stood around looking like ushers equipped with Tommy guns. It was that quiet. It truly was one of the strangest sights of the war . . . this beaten, docile group of Germans at least 3,000 strong guarded by a half-dozen Tommies. On the way out of the stadium I passed a sign on the gate. It advertised a football game between the HSV team, whatever that is, and the St. Paulis football club. Kickoff time was schedule to be 2:30 sharp tomorrow. If the teams play, they certainly will have a full crowd of the Wehrmacht—beaten by another team called the Allies.